Soccer • Club puts shovels in dirt on Herriman facility. 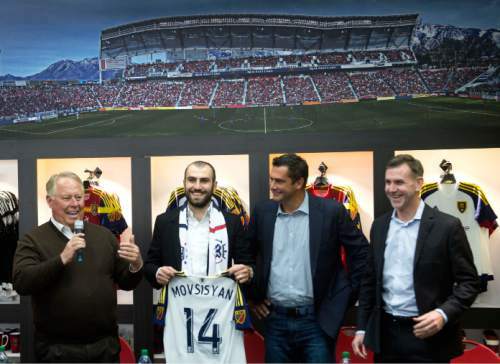 Steve Griffin | The Salt Lake Tribune RSL owner Dell Loy Hansen, left, introduces Yura Movsisyan as the 28-year-old striker re | Courtesy Renderings of RSL's new practice facility in Herriman. | Courtesy Renderings of RSL's new practice facility in Herriman. Steve Griffin | The Salt Lake Tribune RSL owner Dell Loy Hansen, left, introduces Yura Movsisyan as the 28-year-old striker returns to his former club after six seasons overseas in one of the most notable signings in club history at the Real Salt Lake store in Salt Lake City, Tuesday, January 19, 2016. 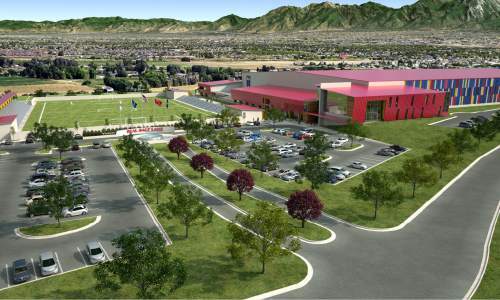 | Courtesy Renderings of RSL's new practice facility in Herriman. 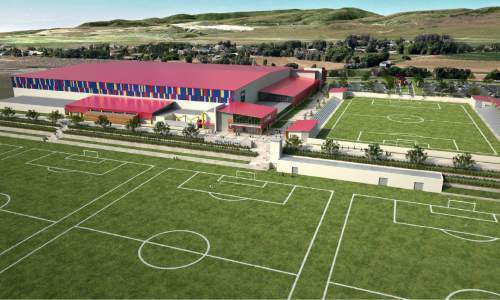 | Courtesy Renderings of RSL's new practice facility in Herriman. Herriman • Standing on a dusty 57-acre plot in the far reaches of the Salt Lake Valley, Real Salt Lake owner Dell Loy Hansen dreamed aloud and grandly of Olympic medals and World Cup victories. "I call it the Harvard of soccer and education," Hansen said, as dozens of trucks and tractors roared during a groundbreaking ceremony Tuesday for the Major League Soccer club&apos;s new $50-million training facility and youth academy. "We literally will have no academy finer in the nation or in Canada than what we&apos;re building here." The project calls for eight soccer fields, which would be used by Real Salt Lake; its minor league affiliate, the Real Monarchs; and the club&apos;s Under-16 and Under-18 teams. The Monarchs will play in a 5,000-seat stadium on the site off the Mountain View Corridor, near 14700 South and 3700 West. "With this facility … and the opportunity we&apos;re going to have to continue to develop young talent, the sky is the limit," said RSL academy technical director Martin Vasquez, who along with his staff and current players will move from RSL&apos;s youth academy in Casa Grande, Ariz., to Herriman when the facility opens next August. RSL officials estimate the facility will be home to about 50 full-time staffers as well as a 250-student charter school with a science, technology, engineering and math emphasis. About 40 of those students will be members of the youth academy. Herriman city officials said they had been courting Hansen and Real Salt Lake for years. The city spent roughly $5.6 million from a Community Development Agency fund to purchase 30.1 acres land for the project and has entered into a longterm lease with Hansen and RSL. City council member Coralee Wessman-Moser said Herriman officials expect to recuperate that money within 12 years through impact fees and tax increment funding. Wessman-Moser also said Hansen had spent roughly $5 million on water infrastructure for the area, which will benefit other future developments in the area. "The heavy equipment is going, the dust is floating in the air and you can smell diesel fuel. I don&apos;t think there&apos;s anything sweeter happening in Herriman today," said mayor Carmen Freeman, who believes the city will benefit from national and international publicity because of the project. City manager Brett Wood said the facility would be a "great economic driver for our community." Herriman youth players would be given special access to the facility&apos;s indoor and outdoor fields as part of the relationship with the city, Hansen said. RSL officials said the franchise intends to continue to keep a footprint in Arizona and could continue operating its Casa Grande academy on some level, but would funnel about six to 12 players each year to the new academy. Hansen, meanwhile, has plans to build regional training facilities in Utah and Arizona, where youth players, ages 7-14, would learn an "RSL-designed curriculum" with the hopes of developing talent to feed into the Herriman academy and eventually promoting the best to the Major League Soccer club.